Titled Beachfront home, steps to the sand! $165,000 Make an Offer !!! 500 M2 / 1/8 acres. Don’t miss this upgraded and enlarged duplex villa, featuring 3 bdrms and 2 full bath rooms. The brand new hard wood kitchen cabinetry was hand crafted from local hardwoods, and an imported granite counter tops were installed providing a luxurious finishing touch on this custom designed kitchen area. The best location in the community! This 1/4 acre lot with a 2,200 sq ft villa and private pool is a fantastic opportunity for someone looking for a full time residence or for a home to generate rental income. The home was remodeled in 2016, has raised 14 foot ceilings made out of native hardwoods, stunning and practical for allowing natural breezes all day long. Over-sized windows and additional illumination have been added, and the floor plan is open and ample. The living and dining area flow out to the extended flag stone terrace in the back of the home, overlooking the beautiful back yard, private pool and thatch hut rancho, perfect for afternoon siestas!! The back terrace has a out door sitting area, out door dining area, and out door BBQ area, perfect for relaxing and entertaining!! Custom home on the Golf Course, close to the beach. 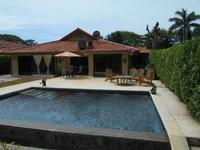 This custom residential home is located within Los Delfines Golf and Country Club, Playa Tambor. Enjoy all the comforts and security of country club living in this custom free standing 3 bedroom, 3 ½ bath home within minutes walking distance from the calm waters and sand beaches. This home includes a spacious open design, a fully equipped modern kitchen and living room along with a dining room that opens to the custom indoor-out door swimming pool area on one side, and on the other side an over-sized outdoor terrace with beautiful views of the golf course. We invite you to come and visit this property, as words nor pictures do it justice. 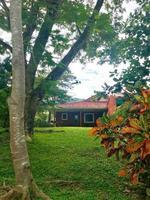 Duplex Home for sale within one of the nicest Golf & Country Clubs in Costa Rica. The property measures 1/8 acre backing onto the well maintained golf course featuring beautiful views. The villa has 2 bedrooms, 2 bathrooms, mini split air conditioning, beautiful topically landscaped gardens overlooking the fairway. Villa is just 2 minutes walking distance from miles of sand beaches and all the comforts of Country Club living including 24/7 security, Golf course, Tennis courts, Restaurant, Pool, Cafe, Pizzeria on the beach, Supermarket and Internet cafe. 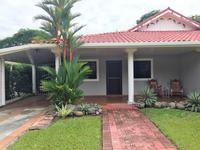 If your dream is to own a beautiful piece of Costa Rica real estate, this 2 bedroom, bath home in Tambor could be your vacation getaway. Don’t miss this opportunity for a beautiful home on the golf course, featuring great views, breezes all year long, mature and lush vegetation, providing privacy in a fantastic setting. This home is a perfect option for full time living or for generating income through vacation rentals. 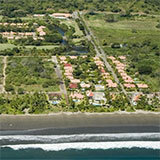 Only 5% of all coastal properties in Costa Rica have a title, making this property very rare ! An opportunity ! This bright, airy and elegantly furnished house in the tranquil and secure Los Delfines Golf and Country club property has everything: Marble and granite counters, tile floors, wood cabinets, spacious walk-in showers, AC and high-speed wireless internet throughout, and private beachfront patio with gas BBQ. There is a Smart TV with Netflix and the house is fully equipped for cooking and laundry. The three bedrooms and their en-suite bathrooms are all located on the second story. 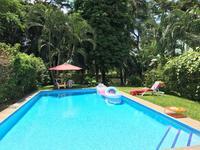 The garden area has lush landscaping surrounding a beautiful swimming pool. Walk a few seconds across its grassy lawn and onto the sand of Tambor Beach. This two bedroom villa has had major modifications and upgrades. The villa was enlarged by over 600 sq.ft., the kitchen was opened and pushed to the back of the house, now featuring a huge space and great views to the pool and back yard. Both bath rooms were completely remodeled, a laundry room and pool pump and utility room were created, and a two car, covered car port was added on. In addition a one bed room one full bath guest house was built in the back yard, with huge bay Windows facing the golf course on one side and swimming pool area on the other. The home comes fully furnished, all appliances are included as well as kitchen accessories, plates, dishes, towels, curtains…..truly a “ turn key” sale. The villa features solar panels for hot water, and individual AC units in each room, making it a much more efficient house to run. 1,150 M2 / 1/4+ Acres. Situated on spectacular over-sized lot, you will find this private villa. The tropical landscape design provides natural shades, and great privacy! The irregular shaped lot is larger than most in this community and backs onto a waterway that feeds into the lake of the golf course, hole number 9. The villa´s location is superb, because it is located only 2 minutes walking from the club house, supermarket, restaurant, tennis courts, golf pro shop, tour center, and administration offices. In the other direction you will find the beautiful, sandy and secluded beach of Los Delfines at a 4 minute walk from this home. The villa features three bedrooms and three bathrooms, a large living and dining area, ample kitchen, and two over-sized terraces, one in the front, and the other in the back, overlooking the amazing back garden and private swimming pool. Turnkey Ara del Mar Residence on rare location! Just steps from the lush and challenging golf course and 5 minutes walk from the tropical beach of Tambor, nestled inside a golf course community, you can find this new 3 bed room, 2.5 bath, two story home. The floor plan is practical and elegant, perfect for vacations, rentals, or full time living. The home features high ceilings, large windows and sliding doors for ample illumination, and bright tile floors to keep the home nice and cool. All rooms feature individual "mini split" AC systems, perfect for controlling the temperature in each room. The home features a covered car port, and a private laundry and storage area. The lush and tropical lot measures 284m2 and features a private swimming pool that sits right off of the back terrace that opens to the living area of the home. This home has an extended back porch and has a unique location as the backyard fronts a park. The home is for sale fully furnished, move in ready! $340,000 Priced to sell quick! Priced under market value to sell quick! This very solid built 2,500 square feet single floor home, features a very open floor plan with 3 spacious bedrooms, 2 bath, fully gourmet kitchen, large swimming pool, gazebo, garage and much more. The kitchen comes with 1st class hard wooden cabinets and imported granite counter tops. The entire back features glass sliding doors and large windows overlooking the swimming pool and private backyard and golf course. Imagine waking up to the jungle sounds of howler monkeys and tropical bird songs as you walk over the breathtaking beach of Tambor in Costa Rica. Or enjoy playing golf in Costa Rica in an unbelievable beautiful setting, in the midst of incomparable tropical scenery of Costa Rica. 2 bedrooms, 2 bath, backyard & front yard, swimming pool, first class Spanish ceramic, block walls, gypsum interior ceilings, pearling structure roof with luxury enamel metallic tile, hot water heated with solar plate and water tank and furnished. Gated community, subterranean water system, electricity, sewage and cables, paved roads, street lighting, private water and sewage treatment plant, restaurant, bar, supermarket, pool, beach, snack bar at beach, 9 hole golf course, tennis, basketbal etc. 3 bdrm condo 160 m2 = 1,722 sq ft. Ocean Dreams, is a condominium project in the Los Delfines Golf & County Club! The luxurious units are located inside the residential community, just a quick walk to the beach, golf course, or club house. This exclusive development features 2 story building, with 8 units, 4 on the first level and 4 on the second level. The building consists of 4 two bedroom units, and 4 three bedroom units. This three bedroom Condo is FULLY FURNISHED and features high ceilings, floor to ceiling sliding glass doors in the living rooms and bed rooms, recessed lighting, individual mini split air conditioning units in each room, and all tile floors throughout the unit. $300,000 Drastically reduced to sell! 1,000 m2 / 1/4 acres / Construction: 260 m2 / 2,800 sq. ft. Attention to detail and crafty design have been interwoven throughout this beautiful 3 bdrm villa, that has been renovated and enlarged. The 2,800 st foot home features a very large master bedroom suite, separate from the rest of house and can be used as a "lock off suite". High ceilings, wood, stone, marble, and granite accents can be found throughout the house. Living areas have great views to the tropical garden and custom made swimming pool area, which feature a large stone terrace perfect for entertaining and sun bathing. Don't miss this incredible opportunity to own the nicest home inside Los Delfines Golf & Country Club. 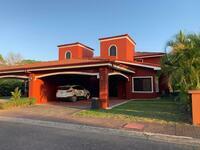 2 Bedroom Home For Sale in Los Delfines Golf & Country Club! Backing onto a fresh water lake, beautifully landscaped with tropical flowering plants and palms makes this estate very unique. The land measures 1/8 acre (500 m2). This 2 bedroom, 2 bath villa measures around 1,100 sq feet of construction and comes fully furnished. 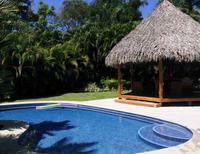 The villa includes a large private swimming pool, and backyard rancho right on the lake! 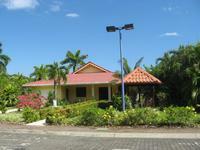 3 Bedroom Semi for sale in Beach Front Community. Living area: 1,250 sq ft. This 3 bdrm duplex villa has been recently upgraded and features a extended back terrace overlooking the tropical garden and swimming pool area. This well-appointed and fully furnished villa is a great opportunity for someone looking for a home to live in full time or use for vacations, or to generate a rental income. The house is for sale “Turn Key” and is ready to be lived in or rented right away. Enjoy morning and afternoon views of the lake, exotic birds, and great breezes. This 3 bed room, three bath home, sits just 100 yards from the beach, and across the street from the great lake at Los Delfines. The house features a large living and dining area, a spacious kitchen with brand new hard wood cabinets and large work space. Living close to the beach with the comforts of Los Delfines Golf & Country Club. 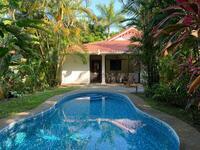 This beautiful Villa is located just footsteps from the tropical beaches of Playa Tambor. 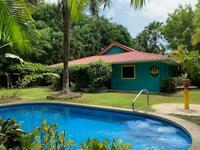 This villa has 2 bedrooms, 2 bathrooms, central air conditioning, beautiful topically landscaped gardens overlooking a fresh water lake full of tropical birds. Three levels, four bedrooms, four bathrooms and a half bath. Beautiful home sites for sale on the golf course featuring fairway views at walking distance from the tropical beach. These lots are ideal to build your dream house in paradise! Century 21 recommends Los Delfines Golf & Country Club in Playa Tambor because it’s a great place to live because of the convenience, infrastructure, 24/7 security, beach, nature, golf course, peace, tennis, basketball courts etc. At Los Delfines Golf and Country Club, you'll enjoy all the charms of a tropical setting of exceptional beauty with a beach which stretches for more than 3 miles, and a backdrop of exuberant vegetation where mountain streams meet the sea. The home sites measure approximately 850 M2 / 9.150 sq ft and are completely flat. 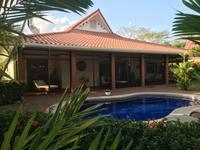 This beautiful 2 bedroom 2 bath duplex villa is located inside Los Delfines Golf & Country Club here on the Southern Nicoya Peninsula, Central Pacific Coast in Costa Rica. The villa is situated on a 500 sq meter lot (1/8 acre) just a mere 5 minute walk from the spectacular and secluded beach of Los Delfines. The villa features 1,100 sq ft of constructed area, 2 large terraces for lounging and relaxing (one in front and one in back) a large master bed room, with in room bath, a guest bedroom, and a guest bathroom. The villa includes a living and dining area and a functional kitchen totally equipped. The tropically landscaped back yard includes a private swimming pool, perfect for outdoor relaxing and entertaining, and borders a year round stream which travels the length of the beautiful golf course. This 3 bedroom, 3 bathroom home is literally located steps from the beach. This is an opportunity to purchase a home at a reduced price inside a beach front residential community with a challenging golf course. The home features a large living and dining area with an ample kitchen. The house features 2 master suites each with on suite full bathrooms, and one guest room with a shared, full guest bathroom. This home has individual split A/C units in each room, and hot water is provided by solar panels. 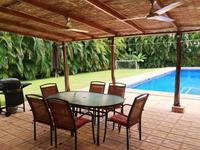 The back yard is tropically landscaped, and features a custom built 50x20 feet (15x6M) lap pool. For more information contact our real estate office onsite! 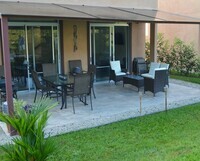 Located inside Beach Front Residential community Los Delfines Golf & Country Club. A very nice opportunity to purchase a fully furnished and equipped 2 bedroom, 2 bathroom villa, 1,000 square feet, perfect for full time or vacation living and rentals. This home is located on the 1st fairway of the Los Delfines golf course, featuring a landscaped and over sized yard, with tropical plants, flowers and trees, a custom private swimming pool, and a bungalow with bedroom/ bathroom and wonderful views of the golf course. 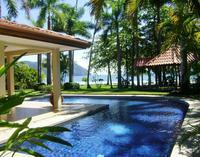 The villa is located only 5 minutes walking to the secluded and sandy beach in front of this gated community. The sale includes all furniture and appliances. Don’t miss this opportunity to purchase a 2 bedroom 2 bath room villa, 1,200 sq ft, perfect for full time or vacation living and rentals. The back yard includes a private swimming pool, and very nice oversized back yard terrace, perfect for outdoor relaxing and entertaining. The villa is located just a mere 5 minutes walking to the secluded and beautiful beach in front of the residential community. 1014 M2 / 1/4 Acres. 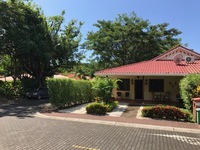 Located backing onto the 8th fairway of the tropical golf course at Los Delfines Golf and Country Club sits this 3 bdrm 3 bath room villa, priced well below market value. 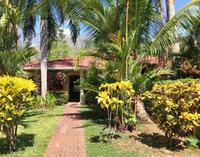 This large 3 bdrm home sits on a 1/4 acre lot, just a 4 minute walk for the beautiful and serene beach at Los Delfines. Sale Price is $270,000.00....don't miss this great opportunity, this home has incredible potential! This 3 bdrm 3 bath villa is located just 60 meters from the beautiful and serene Beach of Los Delfines Golf and Country Club, sits this beautiful home. Three bdrms and three full bath rooms, with a large living and dining area, ample kitchen, 2 spacious out door terraces. The home features individual mini split AC units in each room, hot water is supplied by solar panels, and the home is for sale including furnishings and appliances. The tropically landscaped garden is spectacular, and features a custom built free form swimming pool, and a back yard rancho made out of native woods and imported palm. Living Area : 140 M2 / 1500 sq ft. This luxurious unit is located inside the residential community, just a quick walk to the beach, golf course, or club house. Ocean Dreams is an exclusive condominium, 2 story building, with 8 units, 4 on the first level and 4 on the second level. The building consists of 4 two bedroom units, and 4 three bedroom units. This two bedroom Condo features high ceilings, floor to ceiling sliding glass doors in the living rooms and bed rooms, recessed lighting, individual mini split air conditioning units in each room, and all tile floors throughout the unit. Beautiful views from the balcony! Fully Furnished! !